I put the crew in their wire pen that’s set up alongside the Best Little Trailer. Bridget always keeps a sharp eye on the evil camera. I’ve got a dishpan of water and some Bounce fabric softener sheets. The sheets make it easy to wipe off the bugs on the front of the BLT. I also do the hood of the Perfect Tow Vehicle. Next I clean the spare tire cover which is covered in dust and grime. With energy to spare, I wash all the windows on the BLT and the PTV. That reminds me of something I was told a long time ago when my budget was very tight. When was it not tight? . . . Anyway. I had a job interview set up and not enough money to dress the way I wanted. A mature friend gave me this advice, “Wear good shoes and get a fresh haircut. Then the rest will look good, too.” It’s that way with the PTV. If I make the windows shine, the entire vehicle looks good, even if the rest is a bit dirty. Not that I went dirty to the job interview . . . . Oh, let’s move on. By the time I finish these tasks, Bridget and Spike are tired of their pen. I’m ready for some air conditioning anyway. It’s only ten o’clock but already the heat is bearing down on us. The cool interior of the BLT encourages me to clean inside, too. That hose at the top leads to the shower head. I tackle the bathroom. Actually it’s an easy job. I love the fiberglass everywhere. A spray bottle of cleaner and a cloth, rub-a-dub-dub, and it sparkles. I use three storage drawers stacked under the sink and an open bin for bathroom supplies. I don’t like to hang things on walls. The red rug on the floor adds some color. The blue thing on the sink is a motion-activated light. Minimalist and utilitarian is my decorating style. . . or lack of one. I grab the chance to say goodbye to Murdick. I happen to step outside and see he’s driven his two tractors up on his flatbed and secured them with heavy chains. He’s sitting in the cab of his pickup with Pecos and his Spike on the seat with him. I walk over to his driver’s side. Murdick is a man of few words this morning. “That’s right. All I have to do is wait for the pickup to come that’s going to haul my trailer for me.” Home for Murdick is Laramie. “I was wondering how you were going to get it home.” I can tell Murdick’s mind is on something else, the trip home maybe, rather than chewing the fat with some woman camper. By afternoon I’m restless to go somewhere. I think this depicts the hospital before it was remodeled. I toss the crew in the PTV and we drive into town. Wheatland is easy to maneuver. The streets are wide and . . . absolutely empty! Today is a Sunday. I foolishly thought I’d stop by the Wheatland Book Nook. It’s closed along with everything else in town, except the Sheriff’s office and a small grocery store. It’s obvious when driving around Wheatland that the residents have a lot of civic pride. The American flag flies at several storefronts. The flower shop window displays a handmade poster — “God bless America.” Brightly painted murals on buildings depict historical scenes. Since I’ve been here, I have not seen one piece of litter in town, along the roads, or at the park. I buy a few items at Thrift’s Grocery. Only three cars are in the parking lot. I’m amazed that there aren’t any other vehicles on the streets. Back at the park, I realize no one is in the park either, except for three teenagers and the people camping. Yesterday the park was bustling, cars and people everywhere. It must be the custom here to stay home after Sunday services. Wheatland’s economy is tied to the railroad. The campground is almost empty, too. We’ll leave Wheatland in the morning. A short drive will put us in South Dakota. Tonight I’ll look online and in my atlas for possibilities for our next camp. This entry was posted in Simple living and tagged campground, casita, rat terriers, RVing, South Dakota, Tow vehicle, tractor pull, Wheatland, Wyoming. Bookmark the permalink. Sue, isn’t that a combo toilet/shower? I have a friend who has one and uses it all the time. If I had a working hot water heater, I’d sure use my shower and tub rather than campground showers. In fact, if I had used my head I could have saved a lot of money on campgrounds and only used one every three days or so for a good long shower. I thought I’d use the Casita shower more than I do. I find I’d rather do sponge baths, wash my hair in a dishpan, soak my feet . . . To use the shower I have to empty out the room, and use water out of the fresh water tank which has to be filled … blah, blah. If a shower isn’t going to blast out a lot of water, I don’t like it. I’ve never tried the Bounce fabric sheets to clean the front of my car, but I am going to real soon. I have bugs on there that I can’t get off with regular washing. Now I just need your energy to clean the rest of it. It’s amazing how the bugs wipe right off with Bounce sheets. Sounds like meeting Murdick was a hoot! Your bathroom is spotless! Does thunder bother Spike and Bridget? Is the BLT insulated enough to live in during the winter? ie snow ? I’ve always wanted to see Mt Rushmore….but the roads were still closed when we drove across…same for Yellowstone/Grand Tetons. Spike is afraid of thunder. He’s Mr. Aloof until thunder starts. Then he curls up close to me like a baby and wants covers over his head. The crew and I waited out a snowstorm last fall in NM. My propane heater kept us warm and cozy. The Casita is not meant to be a cold weather home, but you can manage if it’s not too cold. It has been a while since I last noted something on your blog. Things have been busy here. Lost a few friends, sad time but holding onto wonderful memories. I am looking at my own situation changing soon too. We just might see each other on the road in the future. Sounds like everyone, in the town of Wheatland, is exhausted after all the tractor pull fun :o) I bet it is nice to have some quite time to yourself before leaving. Get a good nights rest for your new adventure starts tomorrow. I’m sorry for your recent losses. I hope your situation changes for the better. Sounds like a lovely spot to stay awhile….and so quiet too? I think there are lots of smaller towns that still kind of close up on Sundays. Maybe too, with the heat, it is just more inviting to stay home! Safe travels tomorrow!! Wheatland looks like a good place to raise a family. The BLT is far from spotless. I’m happy I got rid of the bugs. One of these days I’ll polish it up nice and shiny. It’s pretty easy to keep the Casitas clean . Polishing the interior keeps dirt from sticking. Thank you for the great post on Wheatland, hope to stop there next year. Drive SAFE and give the pups a treat from us! You drive safely, too. You’ll be on the road soon. Sue I was wondering how you feel about having a ‘real’ toilet vs a porta potti. I keep wondering if the porta potti is enough or if I need something different. Maybe some of your followers can give there 2 cents worth also. Kathy, although we don’t fulltime, we have a Casita. When we were looking at trailers, a real toilet and shower and a fulltime bed were some of the absolute musts. I really don’t like campground showers. In Texas, especially in the summer, the bathrooms are always hot and steamy. When you finish your shower, you can’t get dry and you feel like you need another. In the Casita, I can shower with the bathroom door open and the AC blasting. I find that dumping the black and gray tanks is really easy and now that we have the Fast Gray mod takes about 5 minutes. Paul and I don’t boondock nearly as much as Sue does. I might take more sponge baths if we boondocked more. Kathy, I’ll add my two cents. We had a cassette toilet (built in porta potty) in our Aliner. It had to be emptied every 2-1/2 to 3 days or the smell got really bad in warm weather. You MUST use formaldehyde chemicals in them to keep your rig from smelling like a sewer. We tried the eco friendly products, and in the summer after one day the smell was unbearable. I had thought that it would be so convenient to just dump it in regular toilets and not have to worry with dump stations. But I didn’t like dumping in friend or family’s toilets. And I didn’t like carrying it into a public restroom to dump. So we ended up using dump stations anyway. Then we got the Casita with the real marine toilet. WOW! What a difference! We don’t have to use harsh chemicals. All we use is Gain Laundry Detergent and a capful of Calgon water softener. It NEVER smells. And dumping at a dump station is so easy, then we are good to go for another week. Porta potties are nice if that’s your only real option for a flush toilet. But if you have a choice, I would say definitely go for the marine toilet. 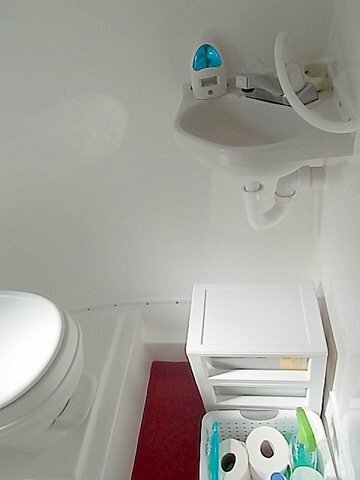 Having used a porta-potti system while boondocking, and now having a real toilet in our rv, I’d pick the real toilet every time. Much easier to use/flush. When it comes to toilets, keep it real. Reine and tinycamper explained it better than I could. I’ve never had the porta potti experience. A real example of rolling up the sidewalks. Ah . . . June and bugs . . . go together like a horse and carriage. Your tidy little bathroom looks so pretty with the red rug providing a shot of color! Thanks, Cathie. I put the rug down because the fiberglass floor was cold for bare feet in the winter. I keep it there because it looks good and keeps the stacked drawers from sliding. 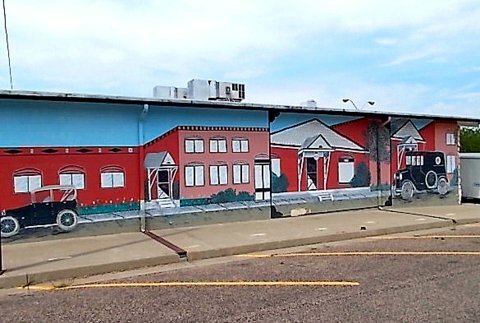 Looking good…I love small town America and enjoy keeping up with the blog. Those dryer sheets are great for keeping the bugs off the dogs too…they work great on our golden…We have a fiberglass TT and I spent the day yesterday washing it….it looks great and I wondered if you wax yours for added protection, and if so what brand do you use?…Ours is 10 years old and has lost a little of the luster….we still love it though! I’m ashamed to say I haven’t waxed the BLT yet. I bought some NuPolish online. It’s supposed to be really good. I used it on the hood of the PTV to test it and I love the shine. Hi Sue , Always wondered how people could be so different,, One town so clean no paper’s, cigarette;s or any other trash in the street’s ,, so clean you spot it right off.. Over the hill just 20 miles away, well lets just stay with vision’s of the nice clean town..
As I left Wheatland I drove the full length of town. I purposely looked for one piece of litter. Nothing. It can’t be attributed to the wind because if the wind blew through some towns I know, the litter would be caught in all the bushes and chain-link fences.. These Wheatland people respect their surroundings. I am sitting here reading you blog, as I do nearly every day, contemplating a thorough cleaning of this trailer. I have cleaned all my outgoing sites, Bill is out repairing outlets and I am caught up with all my campground chores. I think I will go out and try the dryer sheet on the front of the trailer. I wonder if they work in the shower also. Have a good day and thanks for the tip. You have a good day, too, Ann. Ah, the work of a good camp hosting couple is never done, eh? Wheatland reminds me of the small town I lived in during my junior high and high school years. This was back in the days of the Texas blue laws, so there were many things that could not be sold on Sundays. But all our stores were closed anyway, about the only place open was the gas station and the one-screen movie theater. Everyone went to church Sunday morning then went home. I so enjoyed Wheatland’s city park. No young men walking around with their pants falling off and boxers hanging out. Nobody being inconsiderate, playing music too loudly. Everybody enjoying the outdoors and being considerate. It reminded me, too, of days gone by in a small town of my growing up years. We have observed the farther North one goes the Cleaner the Towns & Countryside becomes. Once you are up into Wyoming, they seem to be all pretty clean places without the trash on the sides of the roads. It was like that in North Dakota as well, many do not even lock there doors, autos or homes & could leave the keys in the autos. Or at least that’s what our son told us, when they were living in Minot area. I believe you many have it right, they “respect their surroundings”, not just Wheatland, but the Northern Tier Folks (at least the Mid-West & Western Northern Tier, this keep the places clean of trash extents into Canada as well. Same in Seattle Area.